Things really begin to start to heat up in Houston in the spring and summer seasons, which means the AC flips on and runs consistently throughout the next seven months. Running your AC not only means a bigger energy bill each month, but it also calls for routine maintenance on your HVAC system. In today’s post, we’ll give you tips on how to make your Houston home more energy efficient to prolong its longevity and to save you money on your monthly energy bill. With Owen AC Services, don’t sweat the heat this summer and call us for routine AC maintenance or a new AC installation. If you’re in need of ideas on how to achieve maximum energy efficiency in your home this summer, read on! Energy efficiency is obtainable even when you run your air all summer long! 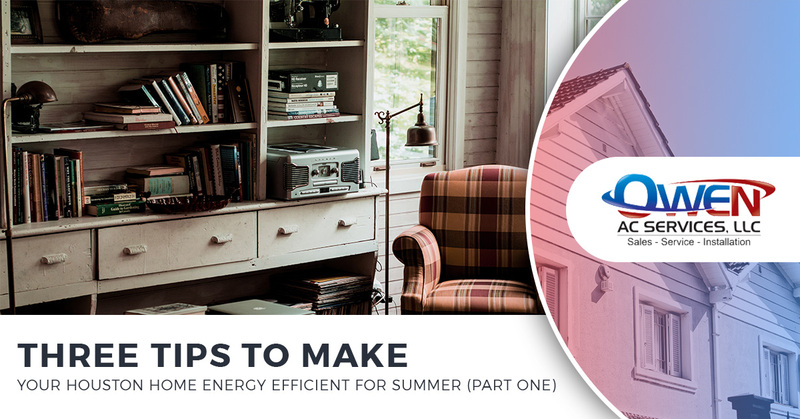 If you thrive in a cool, air-conditioned space every summer, there are inexpensive and uncomplicated things you can do to achieve energy efficiency while reducing your energy costs. In our last post, we touched on replacing old, outdated windows for new ones for optimal energy efficiency, but use your windows to cool your house at night as well. 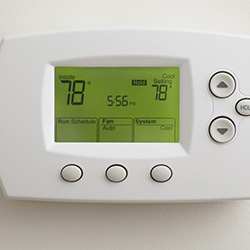 Summer nights in Houston don’t cool too much to a comfortable temperature, so if you have a cold spell or a night where you can open up your windows and let the cool air dissipate indoors, turn off your AC and open them wide! Come morning, close them and the shades to keep the cool air in. It’s easy to get carried away with a strikingly cold house in the Houston heat, that is until the bill comes! Learn how to compromise and set your thermostat a temperature that isn’t necessarily going to make ice cubes, but one that won’t thaw them either. Find a balance and stick with that because the smaller the difference between the outdoor and indoor environments, the smaller your energy bill will be. Most HVAC systems have programmable thermosets that you can set for different times of the day — so if you’re at work all day, there is no need to have it set at a cooler temperature and the same principle goes for the nighttime. Set your thermoset wisely and appropriately and you will save on your energy usage this summer. If you don’t already have ceiling fans, installing them may be a wise decision. Not only do they move air throughout the house, they can also keep your home four degrees cooler while the air conditioning system is running. Only run the fan in the room that you are occupying because ceiling fans operate to cool the people that are in the room through a slight breeze, so if it’s on and you’re not in the room, it’s wasting energy. If you do decide to install a ceiling fan to complement your AC system or want to do an upgrade, find a ceiling fan with the ENERGY STAR label for over 20 percent more energy efficiency. It’s also a good idea to consider what room they’ll be in. For example, if you want one in your office you may want to consider a larger blade with a lower-velocity speed so papers and loose items don’t float around. Having a cool home during the summer Houston heat is probably your number one priority, so having measures in place to keep your home cool and comfortable in crucial during this season. Remember to optimize your windows, control your thermostat, and combine cooling methods for maximum cooling power and energy efficiency! At Owen AC Services, we want you to enjoy the indoors in a cool and calming environment. Nothing productive gets done in a hot home and it makes cooking and doing chores even more unbearable, not to mention makes everyone irritable and cranky when they’re always hot! Keep your home productive and keep your family happy with a properly functioning HVAC system! No other company provides detailed AC maintenance services that check for refrigerant levels, test for leaks, measure airflow, oil belts and motors, and check the efficiency of the thermostat — you want the best in AC repair and maintenance! Call today for AC installation and repair or AC maintenance!